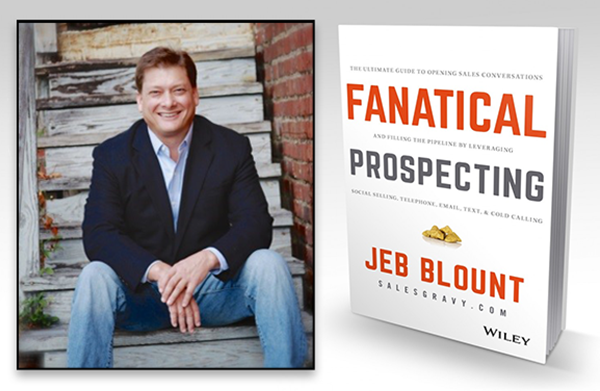 Kennesaw, GA – A long awaited new book by Jeb Blount (www.SalesGravy.com) is hitting the shelves this month called Fanatical Prospecting. I’ve been able to snag an early copy and it is an awesome read and terrific roadmap to jump start your sales campaigns. Prospecting for new clients is red hot these days as every organization needs to keep the funnel of new prospects full. If you don’t stay ahead of the sales cycle, you will experience the lag of keeping a consistent flow of sales activity. The sales process always starts with prospecting. It’s step number one. Most sales people try to avoid prospecting but as Jeb explains in his book, those who embrace prospecting and even become fanatical about it, will be the overachievers and outliers who excel and prosper above the rest. What about some of us who don’t “cold call” for a living? Well, we all sell in some way. We sell internally within our organization, or we are a sales overlay that promotes and encourages those who do have “sales” in their job title. When I emphasize encouraging excellence, I am talking about our outward view of our everyday activities. We sell ourselves and one of the themes Jeb promotes is that a winner is always prospecting. Great sales people sell themselves as much as any product or service. Business doesn’t happen without someone selling something. That’s a beautiful part of our free enterprise system.